BERKELEY — Crack editor and writer by day. Dancer — and actor and yogi — by night. Amy Cranch sounds like someone who might like hanging out with Wonder Woman and Superman. Before arriving at UC Berkeley in 2006, she built a career as a fundraising and communications professional with two child-abuse prevention agencies, the American Cancer Society, the Shedd Aquarium and the Field Museum. All along the way, she has thrown herself body and soul into the performing arts. What that means, day to day, is this: When Cranch is in a performance cycle — as she was this fall, leading to two nights on a San Francisco stage in a group performance called “Homing Devices” — she spends her days at her desk in Berkeley’s University Relations office, managing Homecoming communications, finding worthy alumni to showcase on the campus Wall of Fame or writing brochures, proposals, articles and other pieces. Then, as daylight dwindles, she undergoes a transformation. She hops into her car or onto BART to hasten to the Marin County studio where she studies with the legendary dancer and choreographer Anna Halprin, or to a practice space in San Francisco’s Mission District. Dinner waits ‘til she’s back home in Berkeley with her husband and two newly adopted kittens, long after dark. What drives Cranch — and unites her life — is one thing: a love of storytelling. As a writer, she uses words to weave tales of Berkeley’s greatness, be it students, faculty, donors or alumni. As a dancer, she uses movement to draw her own truths out of the depths of her being, to tell her own stories. Cranch can’t remember a time when she wasn’t moving. “I have pictures of myself in sparkly tutus dating back to 4 or 5,” she says, conjuring memories of her Russian ballet teacher’s crackling knees. It was as a University of Kansas student that she first encountered “world dance,” a performance by a Senegalese dance company. Instead of choreographed forms, Cranch was drawn to ethnic dances, improvisational styles, and ones that blend varied forms of expression. 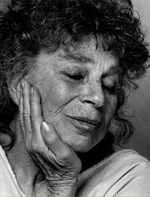 That includes Halprin, a pioneer in the use of dance, movement and storytelling to draw out and express the issues of people’s own lives and of the world. Halprin’s husband, Lawrence Halprin, also was a well-known name on campus. A San Francisco landscape architect who often collaborated with his Berkeley peers, Halprin designed Sproul Plaza, among other well-known public spaces. “I sought Anna out when I moved here,” says Cranch. 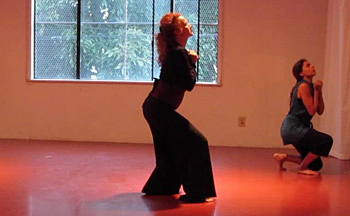 In 2006, she started taking classes on Halprin’s deck/dance space, surrounded by redwoods in Kentfield. Horrified reaction to Uganda’s proposed execution of gays inspired one piece for class. “It affected me so deeply that I created a dance about it,” Cranch says. She wrote a dirge/protest song based on the idea that “it doesn’t matter who you love,” added gestures that could be repeated and mixed in various ways, and performed it in San Francisco’s Castro neighborhood on Harvey Milk Day. Cranch has studied with Halprin ever since. This fall’s performance brought together seven women, five of them Halprin students, to create a largely improvised work around concepts of ancestry, migration and home. Work started in August for the November shows. The group called itself the Wayfinders Performance Group, and they appeared before sold-out audiences at Shotwell Studios in the Mission. Building the work was a process of individual and group explorations that eventually coalesced into a series of vignettes. As late as dress rehearsal, they were ripping the show down and rebuilding, an emotionally exhausting but ultimately rewarding process. Cranch originally thought she would explore issues raised by her move from Chicago, but it became clear throughout the rehearsal process that her current life was more relevant. She and her husband had just adopted two sickly kittens, Nova and Juba, who came from lives of abuse and abandonment. Her solo evolved to focus on what it means to create a home based on safety, nurturance and love. A potentially difficult moment along the way turned out to be serendipitous — and, as Cranch tells the story, reveals the power of the work. One Saturday, the group arrived at their rehearsal space in the Mission and found it in use. Undaunted, they moved to the stinking alley outside and started doing simple movement exercises based on what was going on around them — sirens, murals, a generator’s roar and a woman, homeless or otherwise troubled, who was crouching on the street, hunched over her hands and absorbed in tiny, fidgety movements. “I think she felt we respected her,” Cranch says. And the troupe had a new theme to add to the mix: homelessness. Weeks later, it was showtime. And then, come Monday, Cranch was back at her University Relations desk, seeking out accomplished alums to put up on the Wall of Fame — Pema Chodron, the influential Buddhist nun, one week, Ken Taylor, the Canadian ambassador who sheltered six Americans during the Iran hostage crisis, as depicted in Ben Affleck’s movie Argo, another. Today, she is taking part in San Francisco activities for One Billion Rising, author and playwright Eve Ensler’s global dance initiative to end violence against women and sexual oppression. As always, she has more stories to tell. 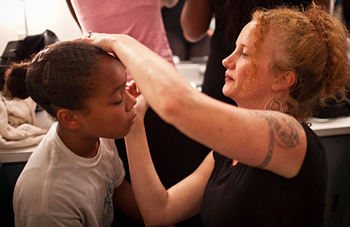 Read Amy Cranch’s first-person piece on volunteering with young local dancers at Cal Performances annual Ailey Camp last summer. Persons of Interest is a regular feature on the UC Berkeley NewsCenter. Know a member of the campus community — staff, student or faculty — who might make a good subject? Send us a note at news@berkeley.edu.